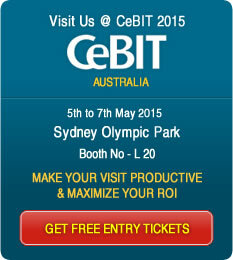 ANGLER Technologies, a pioneering Offshore Software Development Company specialized in offering outsourced product development and IT outsourcing services is glad to announce its participation in CeBIT Australia 2015 for the 6th successive year which is to be held from 5 May, 2015 – 7 May, 2015 at Sydney Olympic Park, Australia. ANGLER being a pioneer in IT outsourcing services explores new horizons to keep up pace with the technology and ensure that our products / services and technologies are scaled to adapt to the technical advancements that are happening day to day. In an attempt to enhance our abilities to reach out to Asia Pacific locale ANGLER continuously participates in CeBIT Australia. With over 12 + years of expertise we offer Outsourced Product Development (OPD) for ISVs, Dedicated Offshore Development Centers (ODC), Mobile App Development, Open Source Development, Custom Software Development and Web Design & Online Marketing Solutions that conceivably run well with yours and end-customer needs. By visiting our booth at Stall Number: L20 at CeBIT AU 2015, you can get inputs on our Offshore Outsourcing Services incorporating Outsourced Product Development (OPD) & Support. We are competent to handle any Custom Software Development, Outsourcing & Maintenance, Software Testing Services, Remote Infrastructure Management and Offshore Staffing & Managed Services. With a mix of technology Skills, we can provide you the most suitable solution. Mobile Application Development – iphone / ipad, Android, Blackberry, Symbian, Windows Mobile, Social Media Applications and significantly more. In this noteworthy occasion, we will be showing our products lineup, Fleet Management Solutions, Time & Attendance Solutions, E-Commerce Solutions, Quality Management Software, Survey Builder & Poll Management Software, Web/Mobile Based Event Management Software, E-Learning & Assessment Solutions, Corporate Instant Messenger, Visitor Management Software, Content Management System (CMS) Solutions, CRM / SFA Helpdesk, HR, QR Code Generator and Custom ERP Solutions. Our stall representatives are planning to receive you in our stall & we have plenty of solution to share with you. We look forward to meet our existing & potential vendors, customers and resellers iat the stall. Register with us online and get free tickets to meet us at CeBIT Australia 2015.